Every day I follow several bloggers and YouTubers to see what they’re doing and to learn new recipes. One of my favorite YouTube channels is without a doubt Haniela’s, which is a wonderful baking channel. If you have not watched her videos, I totally recommend you do because what she does is stunning. 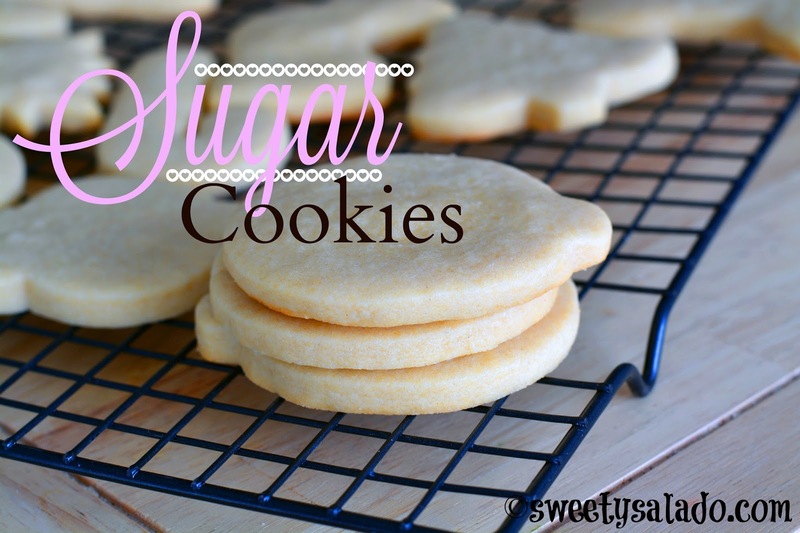 One of those recipes is this sugar cookie recipe, it’s so wonderful that I felt the need to share it with all my followers. I have been making sugar cookies for a while and they would all come out tasting good, but not amazing. I had tried several different recipes, some by really famous cooking experts, but none of them came out as delicious as when I tried this recipe by Haniela. And I really don’t know why because the ingredients are very similar to all the other recipes that I had used in the past and there is no secret ingredient that you need. Perhaps it’s her technique or the easy steps she shows in her video to make them. I really don’t know. But, what I DO know is that this recipes is a keeper. I’ll try to make more videos on cookie decoration in the future, but in the meantime, please check out her YouTube channel to see all of her cookie decorating tutorials because they are really a work of art. Sift the flour and baking powder into a large bowl. Then add the salt, whisk to combine and set aside. In a small bowl or glass, beat the egg with the vanilla extract and set aside. 3. In a large mixing bowl, cream the butter and the white sugar until the mixture is fluffy and a yellow pale color, about 5 minutes. Make sure to scrape the bowl with a spatula to combine it well. Then slowly add the egg and vanilla mixture and keep whisking until it is well combined. Add 1/3 of the flour mixture and start mixing on low speed. Add the second 1/3 and mix again. Then, add the last 1/3 of the flour and mix one last time. Make sure to scrape off the bowl after you add the last batch of flour. Then, knead the dough with your hands inside the bowl for about 30-60 seconds. Wrap it with plastic wrap and refrigerate for 4-8 hours. Pre-heat oven to 375ºF (190ºC). Take the dough out of the fridge and divide it in half. Roll out ½ of the dough between two pieces of parchment paper into about ¼ inch (6.3 mm) thick. Use rolling guides on both sides of the dough to make sure it is the same size. The rolling guides can be two clean painter sticks. Run an offset spatula under the dough to loosen it. Cut out your cookies and place them one inch (2.5 cm) apart from one another on a baking sheet lined with parchment paper or a silicone mat. Store the cookies in the refrigerator for 15 minutes and then bake for 8-10 minutes. Take the cookies out of the oven and let them rest on the cookie sheet for about 5 minutes. 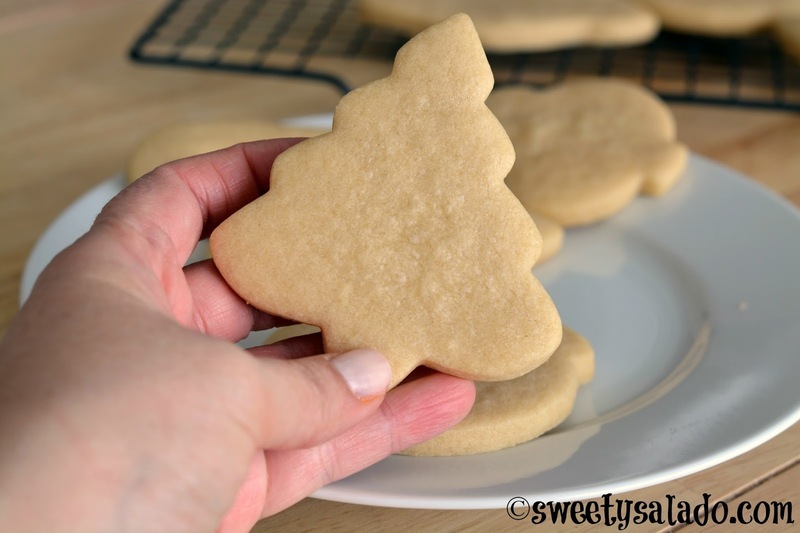 Then, transfer them to a cooling rack to let them cool completely before decorating. You can store them in an airtight container for up to 2 weeks. A light colored baking sheet will prevent the cookies from browning underneath.